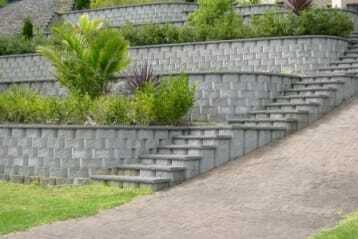 Retaining walls can offer a great look for the exterior of your home or business. They can also be used to create specialized areas for landscaping. Contact Glenn Tech Enterprises and add just the right touch to your property with a new retaining wall. Level out the steep terrain around your property today with a new retaining wall. Use a retaining wall to create large, open areas around your home or business. We work with the finest variety of building materials to create walls: brick, stone, granite and more. Use a retaining wall to keep erosion from happening around your property, while giving it a great new look at the same time. Retaining walls can improve your drainage and be used to take control the flow of rainwater around your building's exterior. Retaining Walls built in Asheville NC, Arden, Fletcher, Fairview, Hendersonville, Candler, Canton, Waynesville, Lake Junaluska, Weaverville, Mars Hill, Swannanoa, and Black Mountain.